It’s mostly good news, but it could be better. While nonpartisan groups say funding is lagging to sign up Latinos to vote in the November election, voter registrations — likely fueled by Donald Trump’s salvos against people of Mexican heritage — are well ahead of 2012 along the Texas border and in the state’s largest counties. Bexar County last week reported crossing the 1 million mark of registered voters for the first time, an additional 30,000 people this year and 80,000 more than in the 2012 presidential election. “That’s the size of a small town we’ve registered this year,” Bexar County Elections Administrator Jacquelyn Callanen said. Harris County has posted an increase of 150,000 since 2012, thanks in part to the 1,200 to 1,500 newly naturalized citizens added each month to the voter rolls, Harris County Voter Registrar Mike Sullivan said. Nonetheless, groups devoted to mobilizing Latinos contend that despite the many newly registered voters, they see complacence by donors and Democratic Party leaders. “Don’t count on Donald Trump being the guy who’s going to get people out to vote in November,” said Ben Monterroso, executive director of California-based Mi Familia Vota. Mi Familia, which has offices in San Antonio, Houston and Dallas, has a goal of registering 95,000 people this year across the country. But the group is less than one-third of the way there and at least 10,000 behind the pace of four years ago. At this point in 2012, the National Council of La Raza had significant operations in Florida, Colorado and Nevada and lesser programs in Texas and four other states. Last week, the group was fully up and running only in Florida. “We have one-fifth the funding we had back then even though Latinos are the talk of the town,” said Clarissa Martinez-de-Castro, the La Raza council’s deputy vice president. Part of the problem, leaders say, involves planning delays due to the late-breaking race for the Democratic nomination. They say, too, that donor money that used to be spent on nonpartisan registration is landing in partisan political operations. Harris County had just over 1.2 million registered voters in November of 2012, so that puts us north of 1.35 million, which is quite impressive. Considering that the 2012 total was barely higher than 2008’s, it’s even more so. As for Bexar County, their registered population actually declined by 11,000 voters from 2008 to 2012, so again, impressive. How much more could we have done if all of these groups that focus on voter registration had been properly funded? I couldn’t say. It would be nice to get all these efforts funded, and I expect that more attention will be focused on them now that the primary has finally been settled. The again, some groups have done better in the resources department than others. The goal for Latino Victory was spelled out in 2014: Elect Latinos to public office. Two years later, the group shows signs of becoming a force in national politics, doubling its receipts and operating in campaigns around the country in a year when Latinos have high hopes for political success. In mid-July, Latino Victory and allies plan to announce a major mobilization of Latino voters around the country to prepare for the November election. “I think that the Latino Victory Project is poised to help create the national narrative about why it is important for Latinos and Latino families to have a stake in this election and how important it is for us to vote,” Muñoz said in an interview. They seem to be more about turnout than voter registration, but it’s all part of the same package. In the end, what matters most is the result. Campos has more. I think it is hard to compare data about voter registration meaningfully. In my precinct of 1500 registered voters, about 30% are persons who have moved or died, but cannot be purged from the rolls until they miss several federal elections in a row. (The dead will be removed if names match obituary/social security information, but that is not always the case.) I regularly report errors to the Tax Assessor for investigation. I doubt many other neighborhood election officials do. In areas with high mobility, more renters, more apartments, I would expect the voter rolls are only about 50% accurate. Accuracy also could vary widely depending on how diligent is the post office in returning unclaimed voter registration cards or noting address changes. To add to Mainstream’s point, it should also be noted that voter registration drives aren’t even close to being the largest component of newly-registered voters (or even address changers). That would be the DMV. Independent efforts such as the ones reported (or even the ones certain campaigns undertake every two years) are still important, but it’s only somewhere around 5-10% of the entire game. That said, I’d love to see more reporting on the numbers of *non-suspense* voter counts. Why is it that certain groups need to spend money on “voter registration drives?” When I turned 18, I went to sign up for 1) Selective Service (the draft), and 2) to vote. I didn’t need “La Familia” or any other group to encourage or cajole me, I just signed up, because I care about the country, and selfishly, care about my own interests. 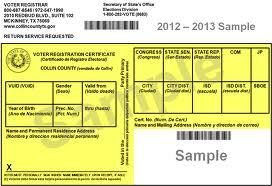 Harris County had 1.2 million voters in 2012, but 1.95 million registered. An addition of 150,000 brings the total of registered to 2.1 million not 1.35 million. It also shows why resources should be directed at turning out registered, not adding to a nonvoting but registered population.